Epsom salts is one of those items we often have around the home but we don’t use it to its full potential. It is a mineral that was first discovered in Epsom, England and most people use it in the bathroom to soak in a tub of Epsom salts and relieve aches and pains. What might come as a surprise to you is that Epsom salts (magnesium sulfate) also works quite well in the garden. It offers a number of benefits to the Gardner that helps to boost the health of the garden and produce more vegetables from the soil where they are planted. 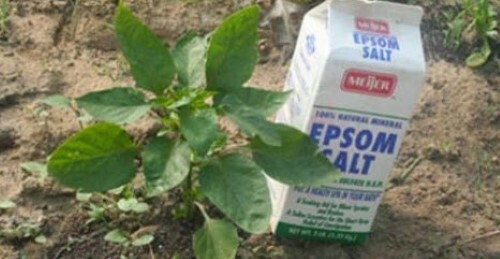 Here are 15 ways you can use Epson salts in your home garden. 1. Nightshades – If you enjoy growing nightshade vegetables, such as eggplants and tomatoes, Epsom salts can certainly help. Nightshades need magnesium, so Epsom salts helps them to grow abundantly. Add 1 tablespoon Epsom salts to your tomatoes and peppers by sprinkling it around the base of the plant. You can also add it to water and pour it in the area. 2. Garden Pests – Epson salts can also help to remove pests from the garden. It doesn’t work the same way as table salt on snails and slugs, but they do find it irritating. Sprinkle some Epsom salts around your garden and keep the slugs and snails away. 3. Sweet Fruit – Adding Epsom salts to bushes, trees and vines that produce fruit will increase the chlorophyll in the plant. Chlorophyll is energy for the plant, so they produce more sugar. 4. Transplanting – When you transparent plants from one place to another, they often end up shocked and sometimes die. Sprinkling a little Epsom salts on the topsoil where the plants are transplanted can help to reduce transplant shock. 5. Green Leaves – If you see yellow leaves on your plants, it may be a lack of magnesium. It is recommended that you use 1 tablespoon of Epson salt per 12 inches of plant height once a month. 6. Weeds – Keeping the garden weed free is a full-time job, but Epsom salts can help reduce the workload. Mix a few cups of Epsom salts and a gallon of vinegar with some liquid dish detergent. Put it in a spray bottle and spray the weeds. The weeds will die, but be careful not to get overspray on the plants. 7. Fertilizer – If you want to perk up your lawn and keep it green, add 3 pounds of Epson salt for every 1250 square feet of grass. Be sure to water your lawn when finished. 8. Tree Stumps – Removing tree sumps can be expensive but Epsom salts can help to ease the cost. Drill holes in the stump and then fill them with Epson salt. You will begin to see the stumps rotting within weeks. 9. Roses – Roses can be rather difficult to grow but using some Epsom salts helps to make it easier. Sprinkle some Epson salt around your rosebushes and they should produce larger, more beautiful flowers. 10. Splinters – Sooner or later, you will end up with a splinter when you are gardening. Soak the area in a mixture of 2 tablespoons of Epsom salts with water. The splinter should come out of your skin on its own. 11. Palm Trees – One of the more common problems with palm trees is that they turn yellow on top. Spray the crown and base with Epson salt and water to treat this problem. 12. Leaf Curling – When you see the leaves of a plant curling, it is a sign of a lack of magnesium. Sprinkle some Epson salt around the base of the plant to treat the problem. 13. Potted Plants – Many potted plants tend to get deficient in magnesium faster than garden plants. Sprinkle 2 tablespoons of Epsom salts in the soil around the plant monthly. 14. Nutrients – When you sprinkle Epsom salts around the base of the plant, it helps them to absorb other nutrients efficiently. 15. Ferns – If your ferns are yellow or dull looking, add 1 tablespoon Epsom salts to a gallon of water and spray them.